By Bharani M in Coding. Updated on August 3, 2018 . The HTML markup that we will be using is very simple, after the HTML5 Doctype declaration, we have the <head> and <title> tags. Within the <body> tag, we have a <section> tag with a class of ‘stacked’. This <section> tag is used to define the width of the content box and to align it to the center of the page. We’ll also use this tag’s class name to target this tag using CSS. A <form> tag follows <section> tag. The form tag does not have a valid value for the ‘action’ attribute, since it is only used for the purpose of demonstration. 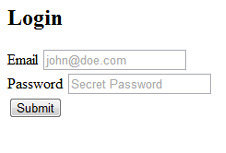 Inside the form field are the declarations for the email and password labels and input field, followed by a submit button. The important point to note here is that we have used an input field with a type of ’email’. This is provided to us by the HTML5 declaration and it degrades gracefully to a regular text input field in older browsers. Editor’s note: This post is written by Bharani M for Hongkiat.com. Bharani is a designer/developer from New Delhi, India. He is currently working on Resumonk.com – an online resume builder that helps you create a professional and beautiful resume in minutes. Also check out his side project – Quotescube.com – your daily dose of quotes.